"Keen-eyed and lyrical, this superbly crafted exploration of the male identity is both rich and touching in its honesty and vulnerability. We see the poet reflect on what it means to be a partner, a father and a man who has lost a father. Emotional and tender but also humorous, witty and philosophical, this is a brave collection from a wonderful poetic mind. No hat, no horse, no Marlboro and yet -- behold the man." Pete Mullineaux has taken the long way round before compiling this debut full collection arranged around themes relating to fathers and fatherhood in particular, as well as male identity in general. While the focus is primarily on the male, several outspoken female voices are present. The writing overall experiments with a variety of forms and reflects a quirky but challenging personal-politics, laced with a rich irony and humour. Pete Mullineaux grew up in Bristol, UK. His poem "Harvest Festival", published, aged 13, in Macmillan's anthology Poetry & Song, was subsequently recorded for schools by Harrap on the album Man & His Senses. Living in London in the 'alternative' late 1970s and early '80s - he worked in a left wing printing press and played in a punk rock band The Resisters - recording an album in 1979 on Munich's Trikont records. When the band split he went solo as singer-songwriter Pete Zero, with gigs ranging from two Glastonbury Festivals, CND protests at Greenham Common and Brockwell Park to sharing the stage with such diverse luminaries as the early Pogues and Salman Rushdie. His protest song "Disposable Tissues" in support of CND won the 1986 City of London Poetry/Song contest and he also published a collection of songs under the same title. Adapting to the emerging new comedy and performance poetry scenes he played host for alternative cabaret group New Variety in the Old White Horse in Brixton as well as performing with the London based Apples & Snakes - appearing in their first publication Raw & Biting Cabaret Poetry. (1985) His one man show - The Performer's Fear of the Gong - was described by What's On Magazine as "A must!" Around this time he also achieved a first class honours in drama from Middlesex University, wrote for the Paul Merton fronted Comedy Wavelength (Channel 4) and a first stage play Wallflowers was produced on the London fringe. her in front, approaching the first fall. while I career on into calmer waters. But now she's wriggling, and free! father and daughter, sailing up the Nile, the Amazon. taking in water, while she shoots clear. Am I sad my boat sank? She asks. or run ahead, removing obstacles. will our game not then be over? holding it under my chin. let's see that dandelion spin! "Pete Mullineaux's collection, A Father's Day, has been a long time in the making. His first published poem appeared in a Macmillan anthology when he was 13 years old. He has since been a member of a punk band, a singer-songwriter, and MC of the Cuirt Poetry Grand slam. Mullineaux is a profoundly sensitive poet, something for which I don't think he gets the credit he deserves. His poem Tonight's The Night is the tender and humorous telling of how once "1975 (I think)" brought his dad to a Neil Young concert: "he wore his suit (Dad, that is -/Neil Young wore a tie-dye shirt.)" It was one of those might-have-been mistakes, which worked out great in the end. Mullineaux surmises that after the concert the "band went back to the hotel/and talked about the old guy in the third from back row/who had smiled all through the concert/and wondered what he was taking..."
I went to the launch of your book in the City Museum on the first Saturday of June, high summer. My daughter was with me. I think you are one of the best poets in Galway - imaginative, innovative, intelligent and poetic. For all the world you remind me of the three Liverpool poets in that Penguin Mersey Sound book - Brian Patten and the others. That was one of the first books of poetry I ever bought - and it had such energy. Well, as I say, I went along to the City Museum for the launch - and everything was right - a fine poet and a beautiful book. The potential of the occasion was huge. When it was over, I walked up Quay Street and then Shop Street. The streets were alive - people everywhere - and one could sense the mood - people interacting etc. etc. And I asked my daughter: Why weren't all of these people at the launch? Why were not even a fraction of them at the launch? And I thought all of these people were missing out by not being at the launch - I think they were seriously missing out. And I said to my daughter: the launch should have been here on Shop Street. Pete and Jessie should have been up here with the books and a table and a microphone. I think the world badly needs books and reading and poetry. You know, down at the Museum that day, I nearly knew everyone in the room. I see these people at these events all the time. For you Pete and for Jesse and for the beautiful book, the room should have been packed. I think we have got to do better. And I am including myself here, and the library service. 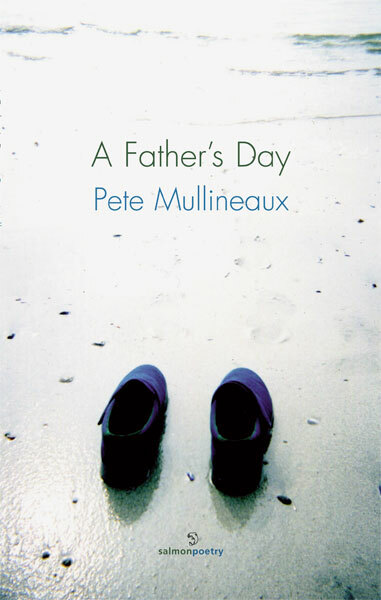 Life is a constant array of emotions, and author Pete Mullineaux hopes to capture that with A Father's Day... Drawing from many sources and many aspects of life, he presents vivid verse that will take the reader on a roller coaster of emotions. A Father's Day is a very recommended pick for poetry fans. Even the red roped barriers impress. I comfort myself with a french pastry.